Climate Accord In Hand, Obama Turns To Senate The deal brokered in Copenhagen "lays the foundation for international action," the president said. The challenge now is to build momentum in the U.S. for a clean energy economy. The first part of that effort is legislation waiting in the Senate. President Obama makes a statement after his return from the Climate Conference in Copenhagen on Saturday in the Diplomatic Room of the White House. 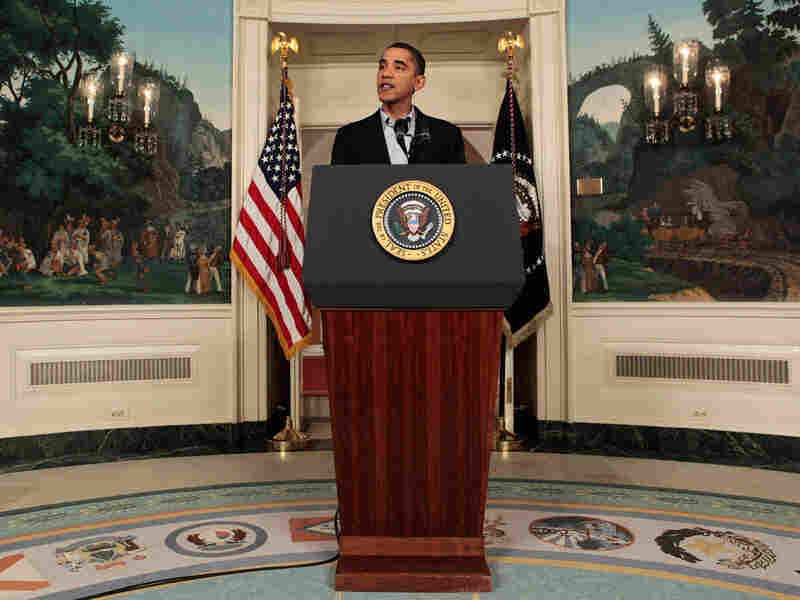 President Obama returned to the White House from the U.N. Climate Conference in Copenhagen in the wee hours of the morning, having secured a modest, nonbinding, three-page deal aimed at combating global warming. After getting a bit of rest, Obama by early afternoon had set his sights on getting a climate bill out of the Senate that, he claims, will curb carbon emissions and, to boot, create new jobs by fostering new industries. In a statement, Obama first lauded his accomplishments in Copenhagen and then focused his attention on Capitol Hill. "For the first time in history ... the world's major economies have come together to accept their responsibility to take action to confront the threat of climate change," Obama said. "After extremely difficult and complex negotiations this important breakthrough lays the foundation for international action in the years to come." The "breakthrough" requires no action by any nation and commits no nation to any legal obligations. Instead it sets goals: to create a $100 billion annual fund by 2020 to help poor nations cope with the threat of global warming; for industrialized and some developing nations to cut carbon emissions by 2050; and to develop a system to monitor whether nations are actually cutting back on polluting the air. The over-arching goal of the deal is to limit global warming to no more than a 2 degree Celsius (3.6 degrees Fahrenheit) increase by mid-century. Copenhagen is once again returned to its citizens and tourists after world leaders and negotiators quickly departed the city at the end of a grueling two-week conference. 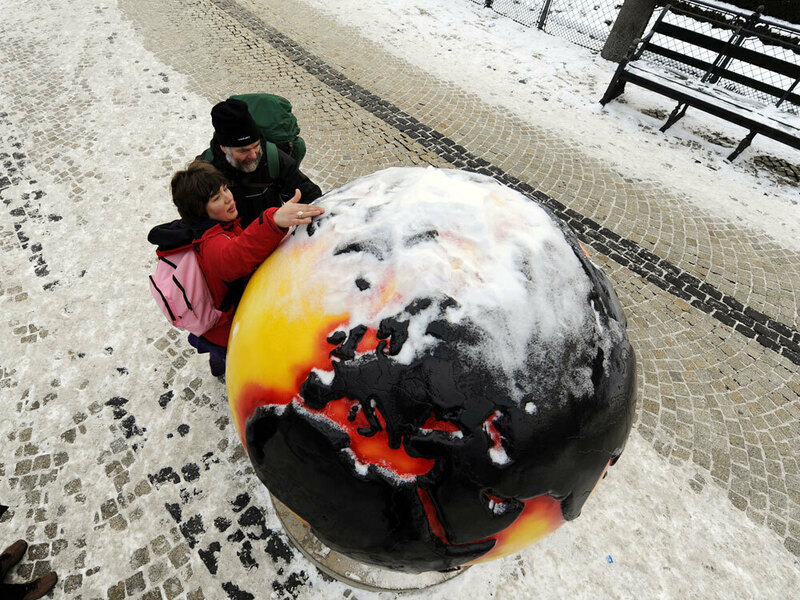 Here, people stop to look at a snow-covered "Cool Globe" part of an exhibition about combating global warming and climate change in the Kongens Nytorv area in the center of Copenhagen. "This progress did not come easily, and we know that progress on this particular aspect of climate change negotiations is not enough," the president said. "Going forward, we're going to have to build on the momentum that we established in Copenhagen to ensure that international action to significantly reduce emissions is sustained and sufficient over time." For the United States, Obama said, "... that means continuing our efforts to build a clean energy economy that has the potential to create millions of new jobs and new industries. And it means passing legislation that will create the incentives necessary to spark this clean energy revolution." The foundation blocks for the clean energy revolution Obama envisions are largely contained in a Senate bill sponsored by Sens. John Kerry (D-MA), Lindsay Graham (R-SC) and Joe Lieberman (I-CT). With double-digit unemployment plaguing the nation, just about any government initiative invites being labeled as potentially creating new jobs. But the measure before the Senate is focused on reducing greenhouse gas emissions by 17 percent by the year 2020, and by 80 percent by the middle of the century. For a nation heavily dependent on coal-fired plants to provide electricity, those are ambitious goals. Kerry, Graham and Lieberman aim to meet those objectives through some non-controversial methods, such as boosting renewable energy supplies and exploring ways to capture carbon dioxide from coal. They also support some very controversial approaches, which could help reduce carbon emissions or decrease U.S. dependence on foreign energy supplies. Notably, the senators propose building new nuclear plants and increasing domestic oil and gas production, both on land and offshore. As well, they support building vast new wind farms — a climate friendly energy source that many environmentalists don't like because it causes "visual" pollution. New jobs are expected to come from the construction of those nuclear plants and wind farms, as well as natural gas and oil exploration. And when might the Senate act? First, senators need to finish work on health care. Climate may make the agenda by spring. Internationally, there is no shortage of complaints about the deal, the heart of which was brokered by Obama with China, India, South Africa and Brazil in the final hours of the conference. The nations most vulnerable to climate change, including low-lying islands, believe the 2 degree Celsius cap on warming won't protect them from the droughts, floods and other natural disasters climate change is predicted to bring. Because the deal envisions emissions cuts no bigger than what countries pledged coming into Copenhagen, U.S. experts say it leaves the world's temperature on track to increase by 3.9 degrees C (7 degrees F) above preindustrial levels, according to John Sterman of MIT. The climate conference also failed to act on one issue many thought was near success: A plan to protect the world's rainforests, vital to a healthy climate, by paying some 40 poor tropical countries to protect their woodlands. Burning trees to clear land for plantations or cattle ranches and logging forests for wood is blamed for about 15 percent of the world's emissions — or as much carbon dioxide as all the world's cars, trucks, trains, planes and ships combined.